(Bloomberg) – South Africa should withdraw its long-delayed draft mining and petroleum sector legislation because the issues with the proposed law are unlikely to be resolved soon, said Mineral Resources Minister Gwede Mantashe. The Mineral and Petroleum Resources Development Amendment Bill has been stuck in a legislative quagmire for years. 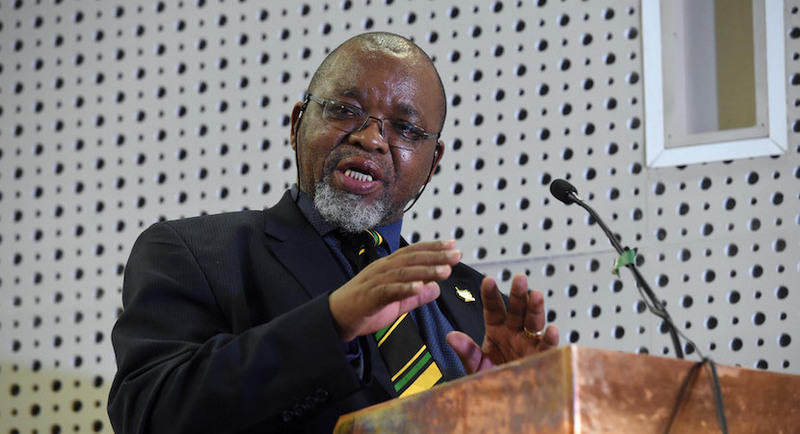 The current law governing the mining industry should remain in place and any changes to petroleum legislation can be dealt with separately, Mantashe said on Wednesday. The proposal would still need cabinet approval, he said. Minerals Resources Minister Gwede Mantashe. The MPRDA bill is currently before the National Council of Provinces, the South African Parliament’s upper chamber. The draft legislation was initially approved by cabinet in 2013, then approved in 2014 by Parliament. Former President Jacob Zuma returned it in January 2015 saying that one of the issues was that the NCOP had not conducted proper public hearings. The draft law touched on several contentious issues such as requirements for local processing of minerals and free-carry provisions on oil discoveries. Trade union Solidarity said that the mining sector’s quest for policy certainty will receive a huge boost if Mineral Resources Minister Gwede Mantashe’s proposal to withdraw the Mineral and Petroleum Resources Development Amendment Bill (MPRDA) is implemented.Solidarity General Secretary Gideon du Plessis said this amendment bill has created uncertainty in the mining sector since 2013, and that its withdrawal as well as the finalisation of the Mining Charter before the end of the year will therefore remove a huge obstacle preventing growth in the sector. “At retrenchment consultations and wage negotiations, trade unions constantly have to hear that the low commodity prices, uncertain regulatory environment and high electricity tariffs are the reasons behind a retrenchment or a low wage increase. The removal of these said regulatory restrictions will therefore be a huge boost for the industry,” Du Plessis said. Solidarity calls on cabinet and political parties to support Mantashe’s proposal and to immediately repeal the amendment bill,” Du Plessis requested. According to Du Plessis, the Minerals Council South Africa has indicated on many occasions that mining houses would actualise expansions and developments worth billions that could lead to the creation of thousands of jobs, provided that the relevant legislation and the Mining Charter protect and promote their investment. “If Mantashe can follow the same pragmatic approach as far as the Mining Charter is concerned by removing the restrictive barbs the charter still contains so that government, the mining houses, communities and trade unions can agree on its content, then Eskom tarrifs would be the remaining major headache,” Du Plessis said.